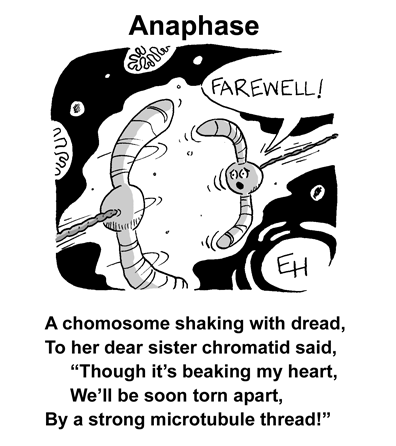 Cartoons, Images, and Ideas for Biologists and Teachers. This example is adapted from Wang, et al, (2013), American Journal of Human Genetics, 92 (2), pg. 301-306. In My Favorite Y-linked Pedigree (Part 1) I described how I use the pedigree below in class. The shaded shapes in the pedigree are deaf. Interestingly, deafness in this family is Y-linked (you can observe that deafness is only passed from fathers to sons). In this post I'll show how I use this pedigree as an introduction to chromosome biology and gene dosage. A nice benefit is that the approach described below also lets the students see how a common bioinformatic tool (the BLAST algorithm) can be used to help solve biological problems. By sequencing the Y chromosomes of relatives in this family with normal hearing and hearing impairment, the researchers determine that the deaf individuals' Y chromosomes carry extra DNA. At this point an instructor could just say what this extra DNA is...but several fun teaching and learning opportunities would be missed. The text box below displays the sequence of some of the extra Y-chromosome DNA. This is not the complete sequence. The complete insert is about 160 kb (160,000 base pairs). Select "Human" from the menu of organisms on the top right of the screen. Paste the sequence above into the "Enter Query Sequence" window and click "BLAST" at the bottom of the page. Here's some sample output. The query sequence is from the Y of deaf individuals. The BLAST search reveals that that sequence originates from chromosome 1. So the extra DNA on the Y chromosome of deaf individuals originates from chromosome 1. This is an example of a translocation. 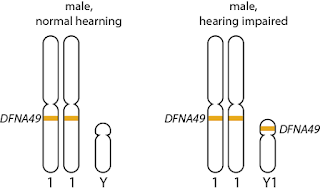 The translocated region of chromosome 1 includes a region called DFNA49 that contains several genes associated with hearing and ear development. 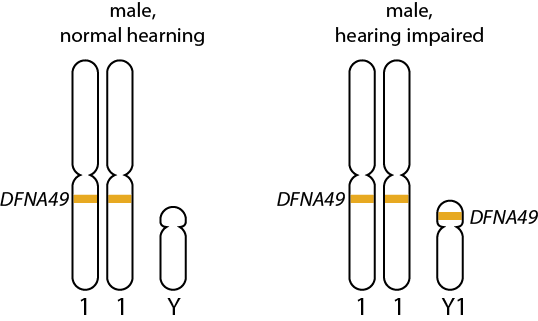 The figure below compares chromosomes 1 and Y from individuals with normal and impaired hearing. The deaf individuals in the pedigree DO NOT have mutant alleles of DFNA49...they simply have too many copies. Presumably it is the increased gene dosage of DFNA49 that results in hearing loss. The researchers use a technique called Fluorescence In Situ Hybridization (FISH) to confirm that DFNA49 is present on the Y of deaf individuals. In the images below (normal hearing on the left, deaf on the right) the DFNA49 shows up as glowing yellow spots. On the left, spots are only seen associated with two chromosomes corresponding to the two copies of DFNA49 on chromosome 1. On the left three spots are seen...on both copies of chromosome 1 and on the Y. From Wang, et al, 2013 (see full reference above). Yellow dots indicate the location of the DFNB1 locus. The chromosomes on the left are from an individual with normal hearing. The left shows chromosomes from an individual with hearing impairment. It challenges students to develop an explanation about inheritance based on evidence. It allows me to demonstrate BLAST, a central tool in bioinformatics. It provides a vivid example of translocation. It emphasizes the importance of gene dosage...extra copies of genes can affect phenotypes! If you can think of other ways to use this Y-linked pedigree or if you have a favorite example of translation or gene dosage, please consider leaving a comment. Thanks!